Michel Kafando, Special Envoy of the Secretary-General for Burundi, briefs the Security Council meeting on the situation in Burundi. Inclusive talks remain the only way to find a lasting solution to the political, socio-economic and humanitarian crisis that has engulfed Burundi since 2015, the United Nations envoy for the African Great Lakes country said on Thursday. Briefing the Security Council a week after the country voted in favour of a new constitution, Michel Kafando, the Special Envoy of the Secretary-General for Burundi said that voting has passed off with relative calm but that some irregularities had been reported by civil society groups and opposition. Burundi’s election commission also reported some incidents at the polls but, in the commission’s view, these were not likely to influence the final result, added Mr. Kafando. The crisis began in April 2015, when President Pierre Nkurunziza began his campaign for a disputed third-term in office, triggering protests and a failed coup attempt. As Burundi now enters an important phase in its history, an inclusive dialogue, which also includes regional actors, is vital to overcome the obstacles in a climate of mutual trust, said the UN envoy. The absence of such reconciliation talks could further polarize an already tense political situation, warned Mr. Kafando. 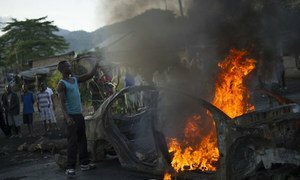 The Special Envoy also told the 15-member Security Council that while the security situation in Burundi is largely calm, isolated incidents of violence remain a cause for concern, calling on the Government to continue its efforts to improve security for ordinary citizens. He also urged the Burundian authorities to resume cooperation with the commission of inquiry established by the Human Rights Council as well as with the Office of the UN High Commissioner for Human Rights (OHCHR).